It takes some nerve to start a restaurant business in Kyoto, particularly if you are an outsider. 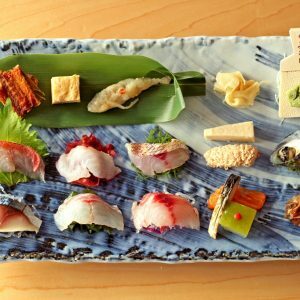 As home to Japan’s imperial court and nobility for over 1,200 years, Kyoto is also the birthplace of Kyo-kaiseki, an elaborate, multi-course meal widely considered the pinnacle of Japanese haute cuisine. What’s more, the people of Kyoto who see themselves as the ultimate arbiters of culinary sophistication, are notoriously dismissive of those who hail from anywhere else. So, it must have been a huge gamble for Wakuden, which originated in the western coastal city of Kyotango, to relocate to the ancient capital back in 1982, even though the move came amid Japan’s go-go years of rapid economic growth and frenzied consumption. 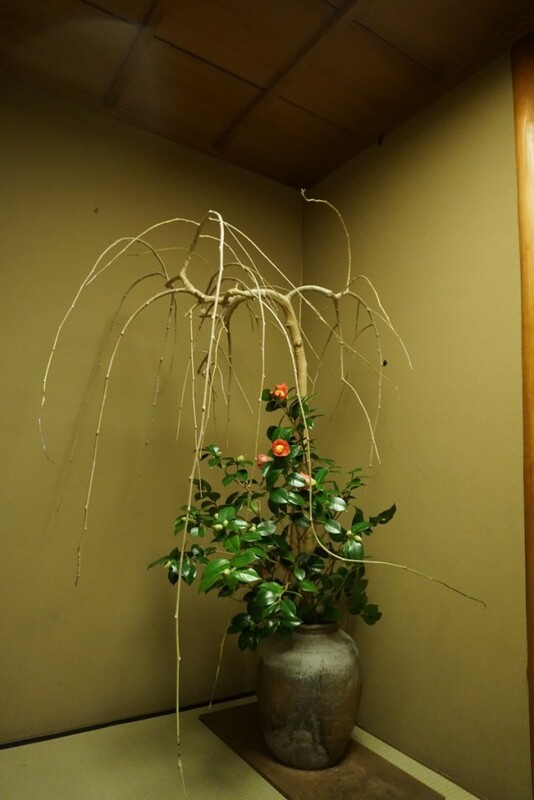 Originally a country inn, Wakuden re-invented itself as a kaiseki restaurant in the hills around Kodaiji Temple, in the Higashiyama area of Kyoto. Kodaiji Wakuden is the original restaurant and the highest-ranked by kaiseki aficionados among several Wakuden outlets. Thirty years later, with two Michelin stars to its name, Kodaiji Wakuden is widely recognized as one of Kyoto’s best kaiseki restaurants. We visited Wakuden one chilly evening in late November, arriving in the pouring rain to be greeted by kimono-clad ladies with umbrellas to keep us dry for the short hop between the cab and the restaurant’s entrance. Once inside, we were escorted into a cozy room with a counter, which we were to share with two other guests – an elderly couple from Tokyo who turned out to be regulars there. “We always come to Wakuden when we are in Kyoto. My husband insists on it,” said the elegantly dressed lady, with a friendly smile. Our course began with a cup of yuzu-yu, or tea made from the fragrant yuzu citrus fruit, which helped to warm us up. The surprisingly young-looking chef behind the counter introduced himself politely and then went about preparing ingredients for our meal. I had to laugh when we were presented with aprons to wear during our meal, a practice I associate more with teppanyaki restaurants than high-end kaiseki establishments. But a quick look behind the counter revealed that there was some grilling to be done. 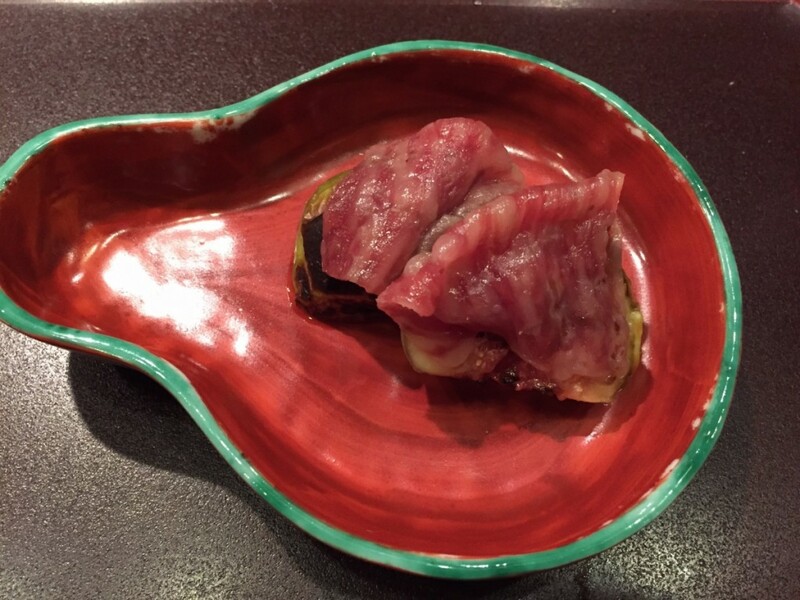 To start with, there was grilled eggplant, which came with shirako-dofu in our first dish. 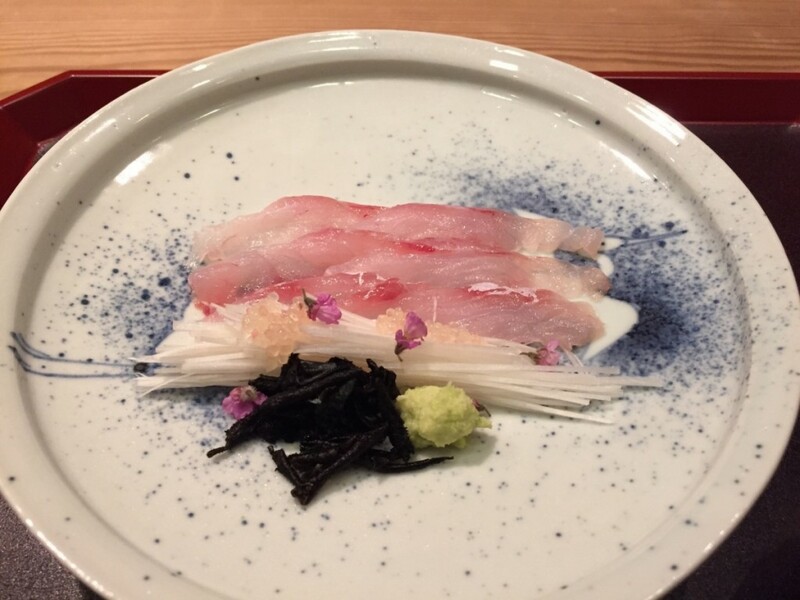 Shirako, which is the sperm sac of male cod, is a delicacy much favored by high-end kaiseki chefs. 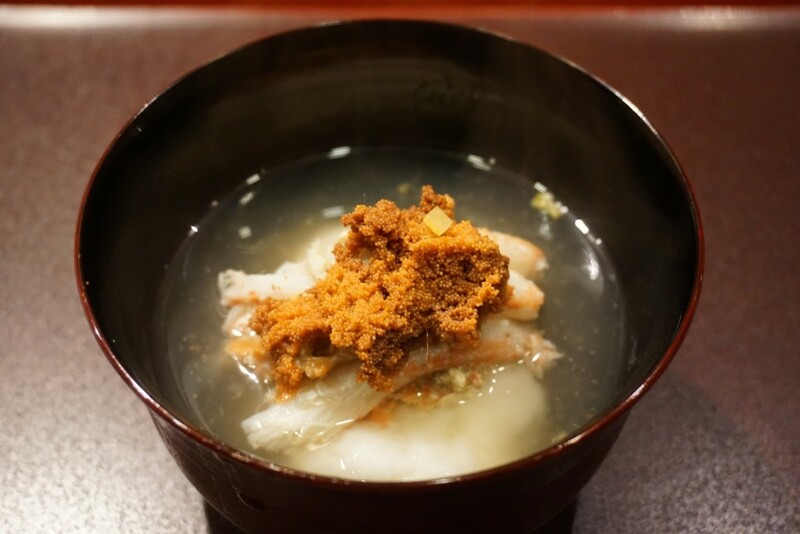 At Wakuden, the richly textured shirako tasted almost like goma-dofu, or sesame tofu. 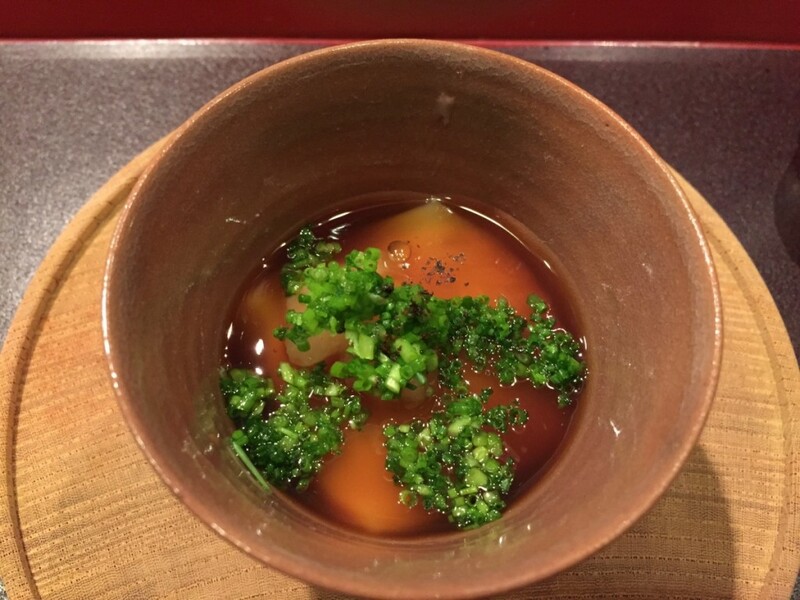 The ponzu, a tangy citrus-soy dressing, and garnish of daikon oroshi, or grated radish, added zing to the shirako-dofu’s dense, creamy texture. Next came two pieces of lightly pickled mackerel sushi, which came close to near perfection, with just the right amount of vinegar to accentuate the mackerel’s flavor. Although we did not order the crab dinner, a seasonal favorite among Japanese cuisine connoisseurs, we did enjoy crab that evening in the form of Kobako-gani, or female snow crab, from Ishikawa prefecture in northwestern Japan. The meat of Kobako-gani, which is a relatively small crab, is known to be more succulent than that of other, larger crabs. The Kobako-gani came with steamed turnip, which beautifully complemented the crab’s intense aroma, as well as its richly flavored eggs. For our otsukuri, or sashimi dish, we were delighted to encounter Guji, which is more commonly known as amadai (tile fish). 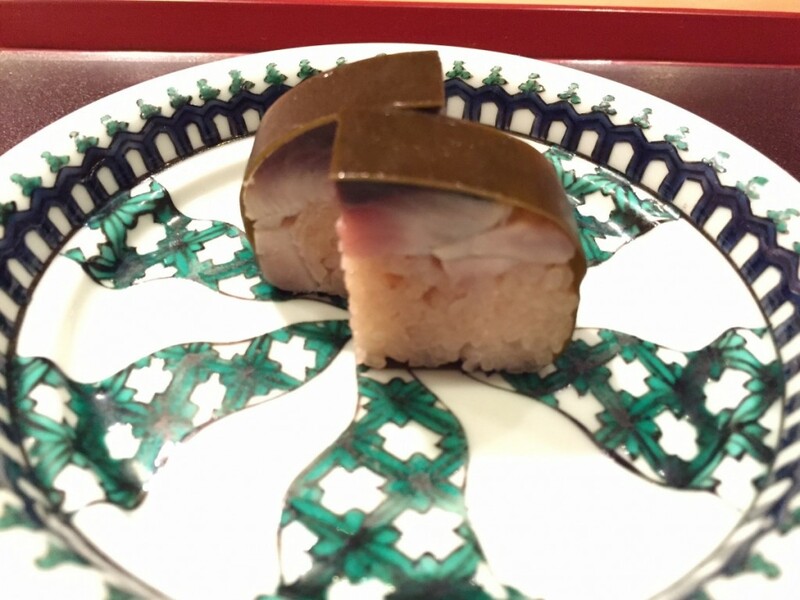 The soft, white slices were to be consumed with thinly shredded white leek, wasabi and nori (seaweed) and dipped in an accompanying ume, or plum, flavored soy sauce. The delicate flavor of the guji was perfectly complemented by the lighter plum-soy sauce; ordinary soy sauce in this dish would have overwhelmed its flavor. While we were working on the guji, our young chef brought out a tray laden with goodies to be put on the grill, indicating that our aprons would continue to come in handy. The resulting grilled ebi-imo (a kind of taro potato) with uni (sea urchin) was a delicious combination of crisp and soft textures, but the real highlight was the scorched beef wrapped around pieces of fig. The beef was marbled, but not at all overpowering and beautifully off-set by the sweet, soft fig. At this point, we spotted our dining companions receiving a rather unusual dish – karasumi (salted mullet roe) wrapped in mochi (rice cake). 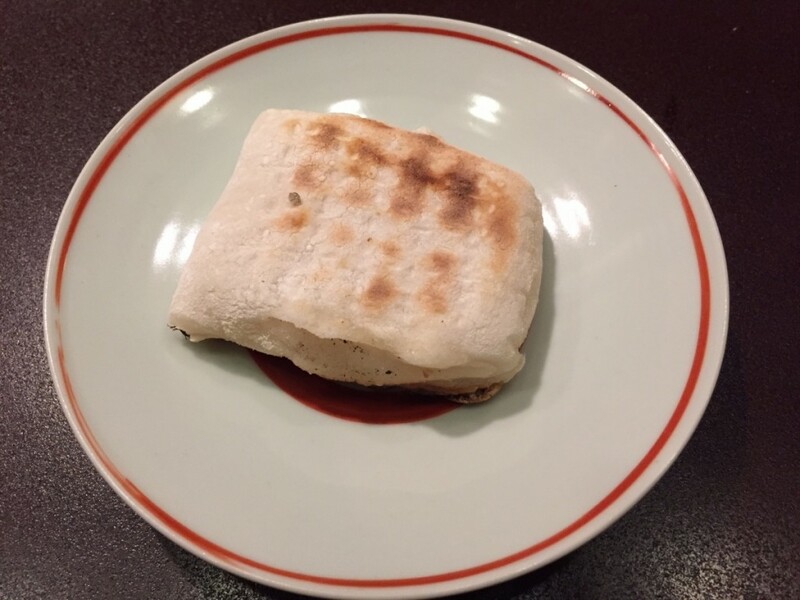 Karasumi is a delicacy particularly loved by sake-drinkers, so it seemed rather odd to combine it with mochi, which is seldom served in high-end restaurants except at New Year. This dish was not part of our course, but our neighbors at the Wakuden counter ensured us that this was a special dish and possibly available only at this exclusive Kyoto kaiseki restaurant. There was no reason not to try it. While my husband and I savored our mochi-wrapped karasumi, our neighbor began complaining about the size of the karasumi. “I’m absolutely certain that the last time I was here, the karasumi was easily twice this size,” he growled at the chef. I was not about to complain myself. The mochi was soft and flavorful – by far the best mochi I have ever had. And the karasumi gave it just the right amount of saltiness and fish flavor. I wasn’t surprised to hear that Wakuden has its mochi made and delivered by a top mochi shop every day. 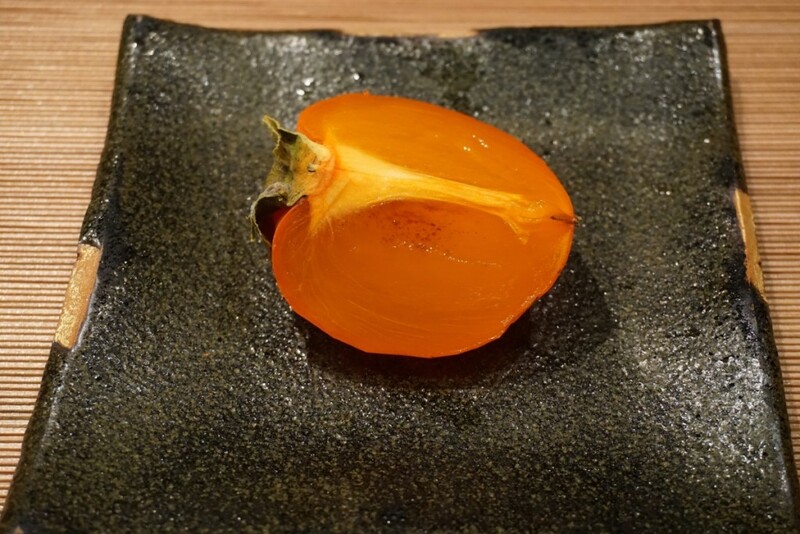 It took a few more dishes before the meal came to an end with two desserts – a section of persimmon soaked in shochu (a distilled spirit) that melted in your mouth, followed by an equally soft walnut rice cake (kurumi-mochi). When making the reservation at Wakuden, I opted for the mid-priced course, as I often do when visiting a restaurant for the first time. Our bill came to Y69,950 for two, including drinks, service and tax. Dining at Kodaiji Wakuden is certainly an expensive night out. 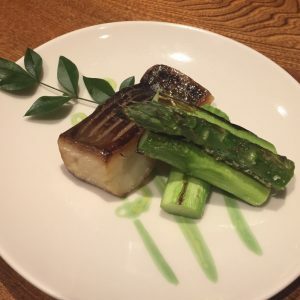 But the quality of the food, the impeccable service and sophisticated atmosphere make it one of the best value kaiseki restaurants in that price range. There are several other establishments in the Wakuden group. 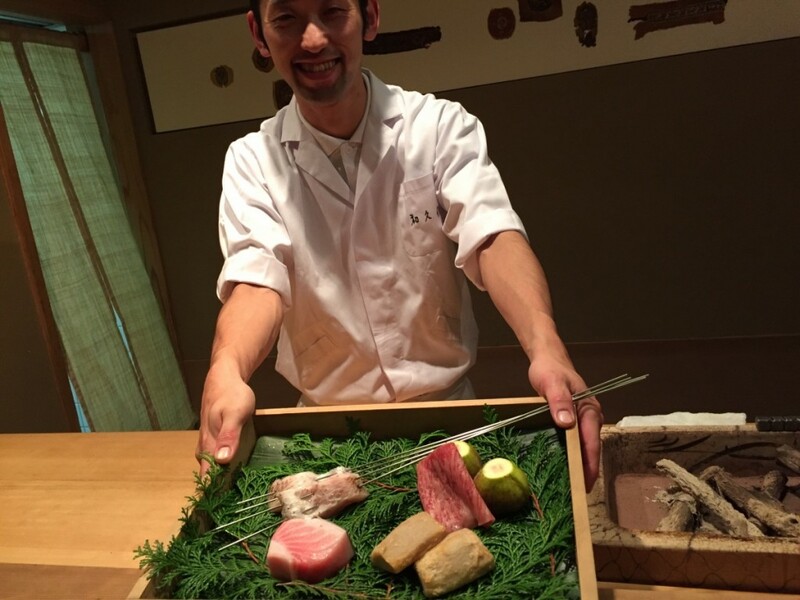 Try Muromachi Wakuden for an equally polished but slightly more inventive kaiseki experience. 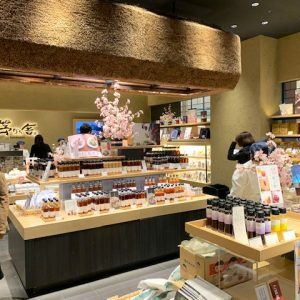 For a more casual version, there is Kyoto Wakuden in the Isetan department store in Kyoto Station that serves lunch from Y2,770 and dinner from Y6,000. Or for something completely different try Itsutsu, a Wakuden restaurant that specializes in soba buckwheat noodles and small dishes.